Ireland are in trouble. Despite the four point margin of defeat, this game was not close, and if the final score was in doubt until the last kick of the game, the winner was decided with half an hour left on the clock. With eight minutes left to play in Lansdowne Road, an almost entirely full strength Irish team was losing to a half-strength French side by eighteen points. The French, playing their second and last of two warm-up games, and with their world cup squad announced more than three months ago, were more interested in getting out of Lansdowne Road uninjured than the cosmetics of the scoreline, and allowed Ireland two late, late tries to soothe the frustration of the home fans. Just as in the Six Nations fixture six months earlier, Ireland sang their anthems and came out blazing. For twenty minutes they played hard-hitting, accurate rugby … and then they fell apart. They started to make costly mistakes, retreated into their shells and allowed the French to take over and score twenty-six unanswered points in twenty-four minutes either side of halftime. Ireland book-ended the match with tries from close in, but didn’t score for more than an hour between them. While the match was full of disappointments, the worst of them was the sight of a heartbroken Felix Jones being taken from the field on a cart with a serious leg injury. Jones has had a horrific litany of injuries to date in his short career, and his late run for a place on the plane to New Zealand looks to have ended on the half-way line of the Lansdowne Road playing field. He came down awkwardly on his ankle attempting to take a high ball, and immediately signalled to the touchline that he was badly hurt. If his starting debut hadn’t gone quite as well as he would have hoped, it ended nightmarishly: a tough blow for a brave and talented fullback, and one that is particularly cruel given his previous misfortunes. While the other disappointments pale into insignificance when compared to his injury, they unfortunately tell the story of the match. Tomás O’Leary, after a bright opening to the game, put together a truly horrendous forty minutes of poor passing, decision-making and kicking which contributed heavily to Ireland’s loss. His ‘clearance’ kick, following a hard-won turnover in the Irish 22 from Jamie Heaslip, found Francois Trinh-Duc in space, and the Montpellier outhalf dropped a tremendous goal from a couple of metres inside the Irish half, a score from nothing which put a spring in the French step. O’Leary’s kick was very poor work from a turnover – far too long for any chaser to apply pressure and directly down the throat of the French playmaker. It was another Heaslip–O’Leary–Trinh-Duc episode which put the final nail in the Irish coffin. From the base of an Irish scrum that was motoring forward, Heaslip put an appalling pass on the floor behind O’Leary. The scrum-half got on the ball and in a moment of madness lofted an unsighted pass across his body and behind the Irish scrum, which was inevitably intercepted by an on-rushing Frenchman – coincidence made it Trinh-Duc, but it could have been any number of them. While the game was undoubtedly slipping from Ireland’s grasp, it was a cardinal error of judgment from a player in wretched form, and he was replaced by Eoin Reddan soon afterwards. With fifty minutes of gametime today, O’Leary may have effectively played himself off the plane. He has had a season disrupted by injury problems, but it is an absolute lack of form rather than fitness which is a much bigger concern: he dribbled passes along the ground, showed no threat of breaking and even his much-vaunted defensive qualities weren’t in evidence. This fourth warm-up match had all begun so brightly, with Jonathan Sexton kicking an early penalty before Sean O’Brien battered a hole in the French midfield to set up quick ball; Ireland moved it left and Cian Healy powered through Morgan Parra for the opening try near the touchline. All those weights paid their dividends: the Leinster man simply muscled over. Sexton faded the conversion across the sticks, but Ireland were abrasive and convincing in the following ten minutes, foolishly turning down a shot at goal from another penalty in front of the sticks to have a run at the French line, a chance that was over almost as soon as it began when O’Brien knocked on. It could have been 14-0, and it should definitely have been 11-0, but Ireland didn’t score after that until the seventy-third minute. With Gordon D’Arcy and Brian O’Driscoll making their return from injury and first starts of the season, the Irish midfield provided little threat. Ball was shipped wide with some nice-looking passing, but the French defense was never held by the threat of a break and could simply drift out to the wings to shut down attacks. While Andrew Trimble continued his lively and hard-running form, Keith Earls had a match to forget. He got the ball in his hands often but rarely looked to link or put anybody else in space; when he did pass, the results were horrific. One was a ridiculous showboat from behind his back directly into touch, and another was flung far over O’Driscoll’s head and behind the entire Irish backline, putting the team under severe pressure. If the game in Bordeaux highlighted Earls’ frailties as a centre, this performance underlined how far he still has to go before he makes the most of his undoubted talent … his passing, his awareness of team-mates and his intelligence in using space and possession were all shown to be lacking. It wasn’t all doom and gloom. The Irish line-out – which had absolutely fallen apart in Bordeaux – was once again an area of strength. The reintroduction of Paul O’Connell and Jamie Heaslip obviously played a part, but credit should also go to a much-improved Rory Best, and to Declan Kidney for keeping faith with the Ulsterman. O’Callaghan challenged well on opposition ball, a facet of the game that was entirely lacking last weekend, and while Ireland weren’t able to put the French lineout under the same pressure that the Harinordoquy and Pierre exerted seven days ago, it was a much-improved effort. The scrum also functioned well against a French front five particularly renowned for their scrummaging. Poux, Mas, Nallet and Papé [and Fabien Barcella, who was sprung off the bench for the second half] are serious operators by anybody’s standards, but the Irish front five more than held their own, and it was a riveting contest. Mike Ross has grown and grown in stature since his rather late selection to the national side, and this performance put another feather in his cap. As important as the tighthead is, scrummaging isn’t a one-man show, and credit should be shared out amongst the tight five and scrum coach Greg Feek: they’ve obviously put in a huge amount of effort to bring the scrum to the level at which it is currently operating. Another positive was the use of the bench. Jerry Flannery and Stephen Ferris came through uninjured and looked strong and abrasive, and Tom Court put in a reasonably good showing for the injured Cian Healy. Luke Fitzgerald continued his ongoing return to form with a great break from well inside his own line to within a metre of the French tryline [from which Jon Sexton scored in the next phase] and came within the same distance again after he crashed through a number of French tacklers off a nicely-plotted backline move near the death. Ronan O’Gara was introduced for Gordon D’Arcy with ten minutes left to play, and Ireland adopted a five-eights system – playing O’Gara at first and Sexton at second – with surprising success; it’s a thought-provoking wrinkle that we haven’t seen before. The biggest impact though was undoubtedly the introduction of Eoin Reddan after fifty minutes for the beleaguered Tomás O’Leary. Reddan and Sexton have played with each other now for two years at Leinster, and it’s obvious that the former Wasps man makes a better partner for the St Mary’s man. Kidney’s continued championing of an O’Leary/Sexton halfback partnership that hasn’t ever functioned is misguided, especially given the scrum-half’s poor form, and the sooner it ends the better. Another black-mark goes against the coach’s name with the failure to give Mike McCarthy more than five minutes of gametime. Donncha O’Callaghan seems to be marked out as teacher’s pet, and giving anybody a genuine chance to challenge for his place by affording them gametime with Paul O’Connell is a step too far with Kidney. O’Callaghan wasn’t as anonymous today as he was for the first hour in Bordeaux, but his pattycake physicality compromises a decent work-rate, and McCarthy deserved the chance to put forward his case for selection. With all that said, this was a tremendously disappointing performance from Ireland. The game was out of reach after fifty minutes, and, as Brent Pope said in the RTE analysis, many of the French players were playing their first game of the season. Ireland have now lost all three of the warm-up internationals they have so far played, and were comprehensively beaten by their bogey team once again. With Robert Kearney, David Wallace and Tommy Bowe due to come back into the side, another injection of quality players is just around the corner, and the use of the bench has been greatly improved from the Six Nations. However, this team has struggled all year to put together more than a half of cohesive, accurate and abrasive rugby, and it looks doubtful that it will all fall into place. Kidney’s man-management has come into question with the news that he has already informed some players that they’re not going to make the squad for New Zealand, and he’s not getting good performances from enough players on the park. The pressure is on, and while he has produced in tournaments before, Ireland have a pretty abject record in world cups. Hopefully O’Driscoll and O’Connell can add their weight and experience to his headshrinker voodoo and start to get this team performing to at least the sum of their parts. 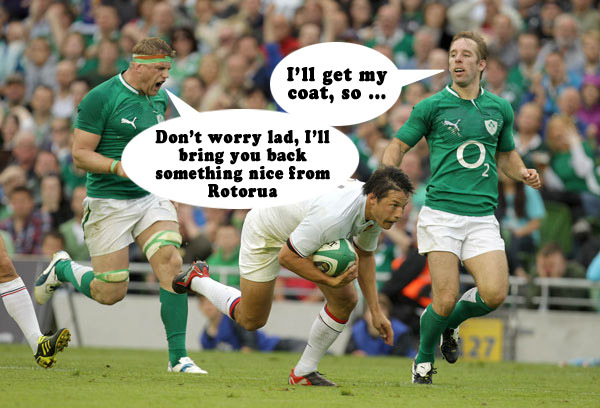 This entry was posted in Match Reaction and tagged Abject Defeat, France, Ireland, RWC 2011, Warm Up Match by dementedmole. Bookmark the permalink.